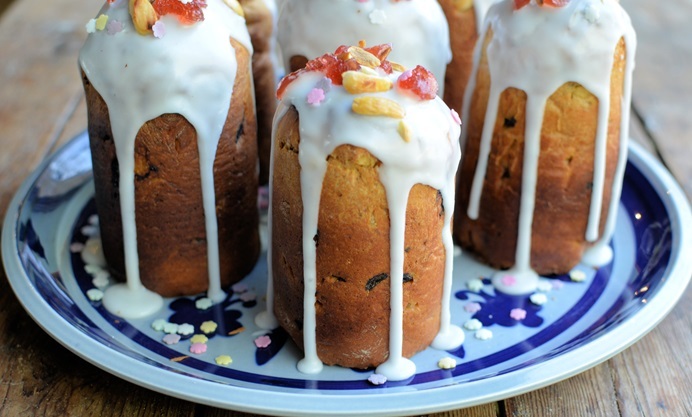 Kulich is delicious sweet bread commonly eaten in Russia on Easter day. 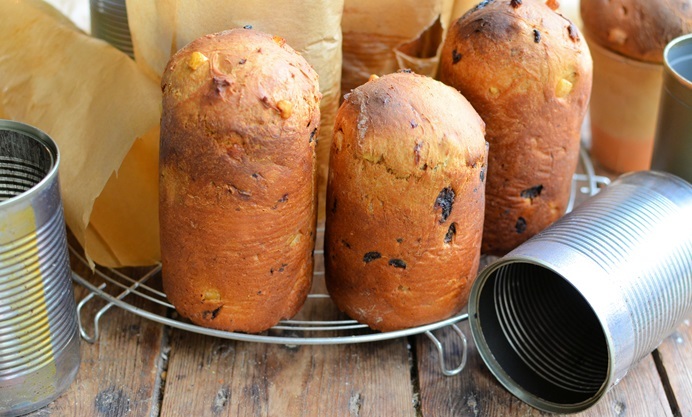 Similar in shape and flavour to panettone, kulich is packed with fragrant spices, dried fruits and citrus peel. Bake up a batch for breakfast on Easter sunday or serve it with a slice of pashka – its traditional accompaniment – for an indulgent afternoon snack. Easter is a very important festival in the Christian calendar, and alongside the religious rites and rituals of the celebration there are a number of foodie traditions, too. As well as the classic Easter lamb lunch. the British have hot cross buns, the French have brioche de pâques, the Germans have osterbrot and Russia and other Orthodox countries have kulich. Kulich are sweet, egg and butter enriched bread buns baked in special tall tins. 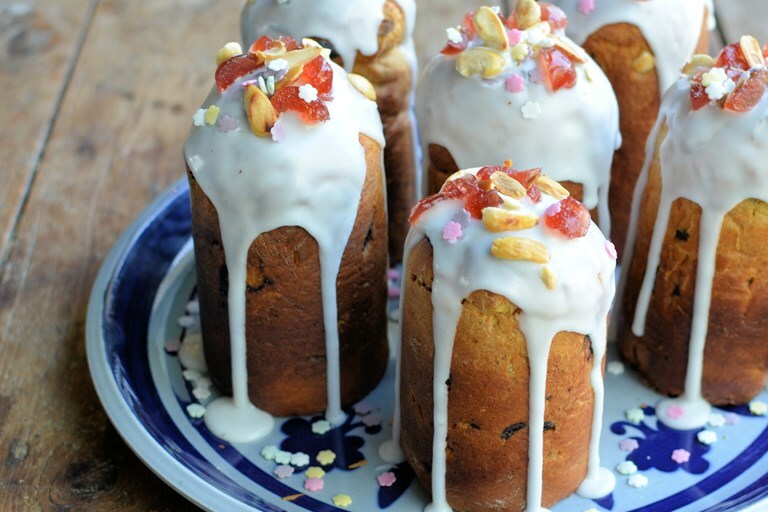 Once cooked, the kulich are then decorated with icing, candied fruit and nuts – think a taller hot cross bun that is iced, and you have the picture. Sweet breads are very popular throughout Europe as special Easter fare; at the end of Lent, it’s time to make merry on the tea time table again, and after several weeks of enforced fasting where luxury ingredients such as eggs, milk, cheese, sugar, cream and chocolate were abstained from, it seems to be a very popular tradition to make rich sweet breads that are studded with fruit and that are aromatic with warm spices. Kulich are a good example of this sweet bread tradition. They're essentially a brioche dough which has dried fruit added, decorated with lemon-spiked icing and a scattering of glacé fruit, nuts and cake sprinkles as the final flourish. 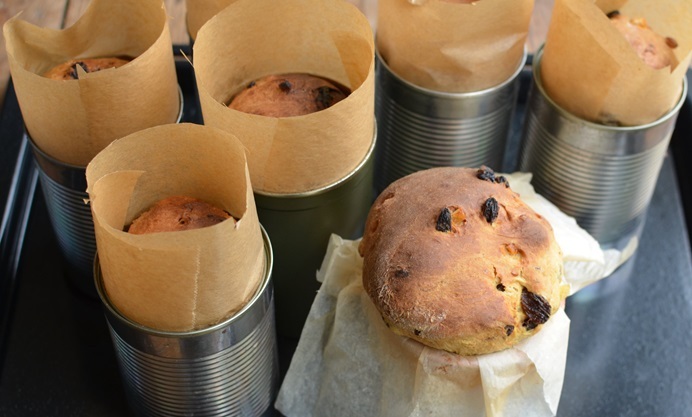 If, like me, you don’t have a special kulich baking tin, then just use some tins from canned food such as baked beans or tomatoes – wash them thoroughly first, of course, and make sure there are no sharp edges along the top. Note: If you have a bread machine, you can start the dough in the machine up to the second proving stage. Add the dried fruit 5 minutes before the end of kneading or when your bread machine beeps.